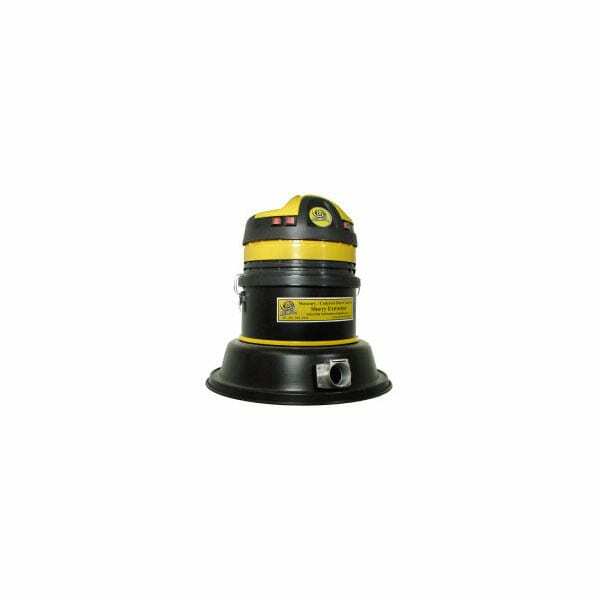 Equipped with higher Static Suction Lift motors to vacuum wet & heavier debris. Identical to Barrel Heads with Dry Filtration but the wet model uses industrial grade motors with greater static lift (H20) and a wet filter cage for extracting liquids, slurry, heavy sludge, heavier weighted debris. Includes the same 2″ x 12′ HD Crushproof Hose and a 16″ Squeegee Floor Sweep. Powerful suction motors + the upgraded HD Crushproof Hose leaves surfaces dry. IMPORTANT: All Dust Director Barrel Vacuums use a HD Crushproof Hose. 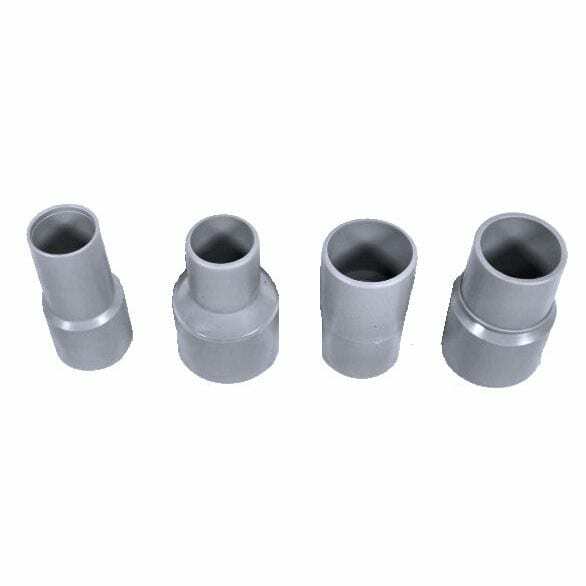 With the hose extending and curving 3′ downward from the drum adaptor the heat generated from the motors using a lightweight hose is known to collapse the hose at the downward curve. The Dust Director Barrel Vacuums with the Adaptor are for installing onto standard size 55 Gallon Drums. Instantly converts the 55 gallon drum into a large capacity wet/dry vacuum. A Barrel Vacuum is especially suited for applications when large amounts of debris (general purpose dry, saw dust, nuts, bolts, bullet shells, rubber, liquids, sludge, slurry, etc) need to be conveniently and efficiently vacuumed and contained. Additionally, wet splashes of liquid and debris are busted and deflected by the perforated float cage to prevent slashes of liquid and/or debris from entering the motor head housing and prematurely damaging the motors. The powerful USA Designed and Made Motors provide impressive 2-Motor Suction, to quickly extract liquids, slurry and even heavier debris. Common Applications: Concrete Slurry, Gutter Cleaning (using Optional 2″ x 50′ HD Crushproof Hose), etc. – – – whenever rather larger quantities of liquid waste needs to be vacuum and easily contained, sealed and transported in a 55 gallon drum. When lightweight and dry debris is being extracted (such as wood dust), the optional Flutter Filter is highly recommended to prevent premature filter blinding. For additional information on the Flutter Filter, see next: 14″ Flutter Filter. Dual fan cooling motor prevents the motors from overheating and extend the motors’ life. 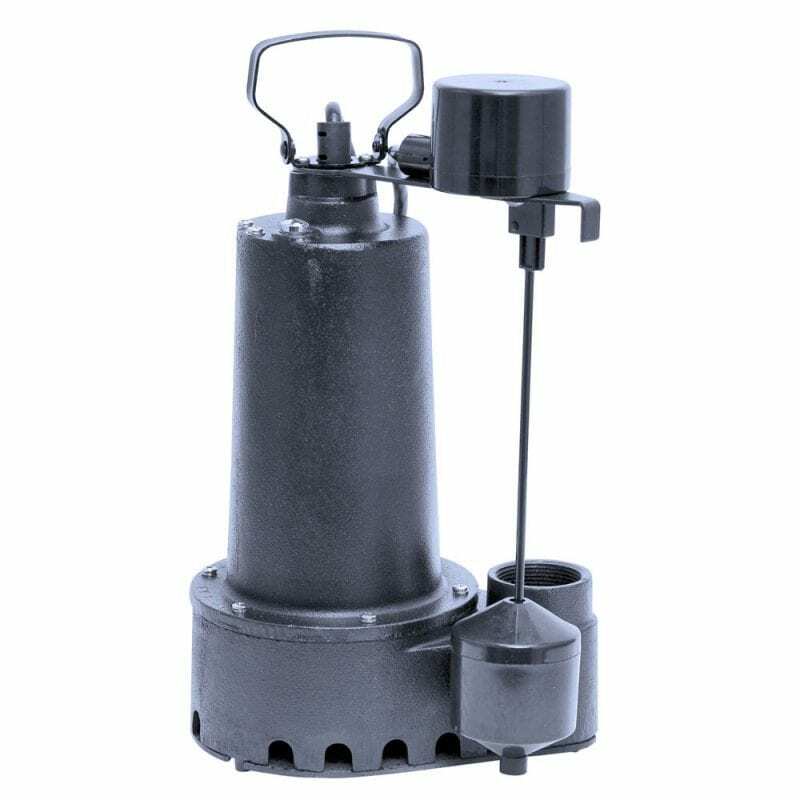 While the BV-W2000 is specifically designed for wet debris extraction, the optional dry conversion filter is easy to install. Additionally, the dry conversion kit includes Dust Director Clean Extreme HEPA rated cartridge filter permits simultaneous dry and wet recovery without the hassle of changing filters during a clean-up project. The filter is easily removed from its filter cage for washing and re-use. Uncompromising Power – Our unique but very simple AIRFlow HEPA Filter System guarantees constant high suction power at all times, longer periods of uninterrupted operation, lower maintenance costs and a longer service life. DUST DIRECTOR’s CLEAN EXTREME HEPA CARTRIDGE FILTER. 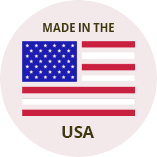 Utilizing state of the art manufacturing and in house testing, the filter has been specifically designed to provide the performance required for the proper operation of a Dust Director® Vacuum. Wet & Dry Use + HEPA Rated + Longer Life with Applied PTFE Membrane: The Non-stick Dust Release & Water Shredding PTFE Membrane enhances the filter’s capabilities in several areas, including filtration efficiency (meets or exceeds a HEPA rating), cake release, cake prevention, “extreme” service life. A filter’s base fabric is typically made of woven or felted synthetic fibers, natural fibers or fiberglass. The membrane is a mechanically applied surface treatment (extremely thin, from 0.4 to 10.0 mils) that requires the filter’s fabric for support. Provides surface filtration rather than depth filtration (which is provided by conventional filter fabric). Surface filtration keeps the captured dust particles away from becoming impregnated into the base fabric, thus reducing fabric abrasion and extending the filter’s service life. With longer service life you won’t need to change the filter nearly as often which reduces your replacement cost and downtime during operations. Reduce pressure drop, cut energy (motor) costs. The membrane typically prevents pressure drop across the filter by about 10 percent. 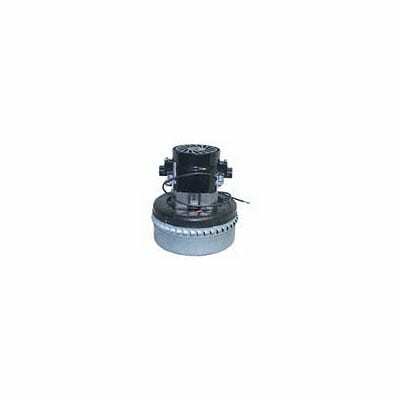 This in turn cuts wear on the vacuum’s motor(s) while reducing power consumption by as much as 33 percent! Extreme Dust Cake Release / Extreme Dust Cake Prevention. The expanded PTFE membrane is slicker than a conventional filter fabric and it easily releases any dust cake during cleaning. Most people purchase a vacuum cleaner based on improvements or features of the vacuum cleaner. The vacuum’s cartridge filter alone, applied with a PTFE membrane, will increase the vacuum’s performance by as much as 25 percent – thereby increasing production rates for your entire operational process. 5) Extreme & Diverse Applications. The expanded PTFE membrane can withstand the most abusive of applications, dry or wet, and temperatures up to 600°F — highly suitable for high-temperature applications such as when removing hot mastics. Additionally, as stated, the filter is complete washable. While the PTFE membrane increases the filter’s and vacuum’s cost, the initial cost is offset by improved filtration efficiency, vacuum performance and longer filter life. FLUTTER FILTER – Optional Filter: Compliments and protects the HEPA Pleated Cartridge Filter. Placed and dropped down inside the Cyclone of the Barrel Neck, which protects the Flutter Filter from the incoming debris. The air speed, protection and turbulence created from the Cyclone is used to accelerate the fluttering speed of the Flutter Filter. The pleated HEPA Cartridge Filter (above), with the Flutter Filter installed, is then protected by the Flutter Filter. The HEPA filter may get dusty but it will not get caked from the incoming debris – including concrete dust. 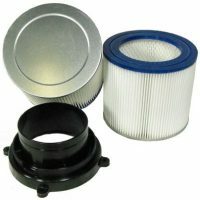 Furthermore, the Flutter Filters increases the life and durability to the HEPA Cartridge Filter. Completely washable, dust and water repellant. As soon as the vacuum is turned on the tightly weaved “but loose fitting” Flutter Filter beings to flutter and shake. Using air speed and the chaotic turbulence inside the collection tank, the constantly and naturally in motion Flutter Filter prevents debris and powders from prematurely blinding its surface to prevent premature suction drop. When the vacuum is turned “off” the filter drops . . . effectively releasing any caking. Additionally, to help prevent blinding while the vacuum is on, the floating filter cage inside the Flutter Filter swings freely and loosely as it is shaken and knocked about from the air speed and turbulence inside the Cyclone. Keeps the vacuum’s HEPA Cartridge Filter from caking. While it may become dusty it will not cake. Durable & Versatile – Collects dry or wet debris without compromising its effectiveness. 1/4 HP, 7.6 Amp, Tethered Float, 10′ cord length, 1 Year Warranty.